A painting of Professor Kibble, a long-time member of Imperial's Department of Physics, has been unveiled by his children. 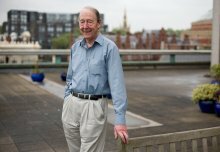 Theoretical physicist Professor Kibble started work at Imperial in 1959 and continued working long after his retirement. He passed away in 2016 at the age of 83. Tom went out of his way to nurture junior scientists. He was really unique, and we miss Tom and his wonderful contributions. At an event to mark the unveiling a series of former colleagues paid tribute to the contributions Professor Kibble had made to physics but also as Head of Department and especially as a mentor to young scientists. To commemorate his legacy at Imperial, his three children, Robert Kibble, Alison Martin, and Helen Wilson, unveiled a portrait of him at an event recognising his work. Opening the event, Professor James Stirling, Provost of Imperial and a theoretical physicist himself, said: “I was one of the hundreds of thousands of young scientists that Tom inspired. Professor Kellogg Stelle, a theoretical physicist at Imperial, and Professor Anne-Christine Davis, from the University of Cambridge, described Professor Kibble’s research. His seminal work came in the 1960s, whilst working at Imperial, which led to the concept of a new elementary particle now known as the Higgs boson. This particle, which gives all others mass, is a key feature of the Standard Model of particle physics. Its existence was confirmed experimentally by the Large Hadron Collider at CERN in 2012. Professor Kibble also worked in cosmology where, by applying some of the ideas of particle physics to the time of the Big Bang, he formulated a way to explain some of the large-scale signatures we see in the cosmos today. Professor Sir Jim Virdee, who came up with the concept for, and oversaw the construction of the Compact Muon Solenoid (CMS) experiment at CERN, which detected the Higgs boson. Professor Virdee told a story about the discovery of the Higgs boson that summed up Professor Kibble’s humble personality. When told he could come to CERN one day for a ‘special announcement’ around the Higgs boson, Professor Kibble said he would rather attend Professor Virdee’s colloquium the next day at Imperial. At the Imperial event, Professor Kibble received a standing ovation when invited onstage, in response to which he simply nodded and said ‘thanks’. 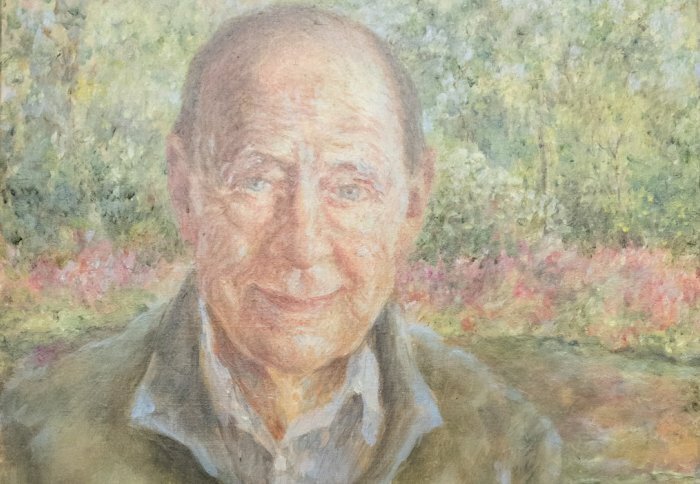 The portrait, painted by Tess Barnes, will soon be on display in the Blackett Laboratory at Imperial.